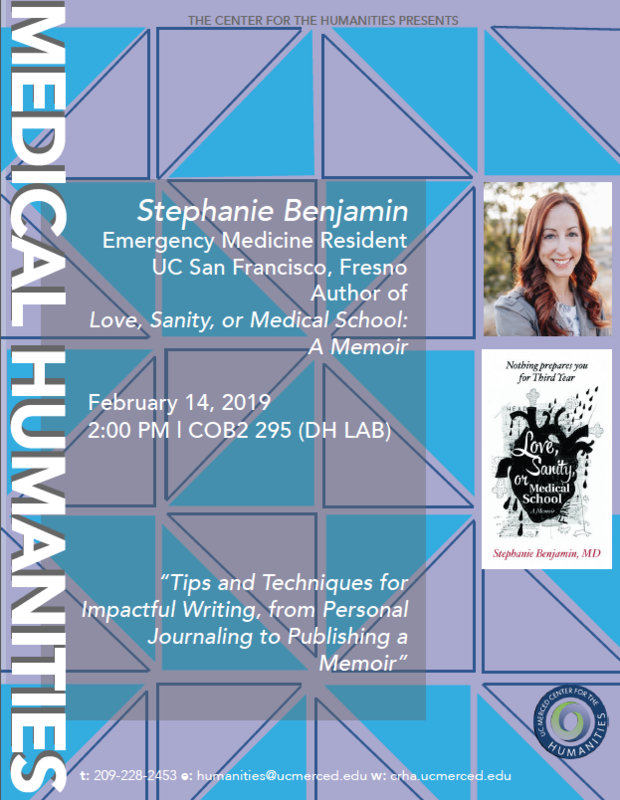 "Tips and Techniques for Impactful Writing, from Personal Journaling to Publishing a Memoir"
Home › Events › "Tips and Techniques for Impactful Writing, from Personal Journaling to Publishing a Memoir"
Join us February 14, 2019 as Emergency Medicine Resident and author of Love, Sanity, or Medical School: A Memoir, Stephanie Benjamin, gives a lecture as part of the Center's Medical Humanities series, titled "Tips and Techniques for Impactful Writing, from Personal Journaling to Publishing a Memoir". This talk will be held in COB2 295 (Digital Humanities Lab) at 2:00 PM. We hope you can join us.